To understand these benefits, we start with the basic concept of direct drive whereby the force of a motor is directly applied to a mechanism without any intermediate drive train such as a gearbox or toothed belt etc. The core working principles of direct drive motor technology is in essence based on the right hand rule of electromagnetism, whereby a current moving through a wound coil creates a magnetic field. Direct Drive technology has been around for over 40 years. Despite this, there still is a lack of understanding by many machine builders. Even those who are familiar with it, may not have a desire to adopt the technology, considering it as too high-end when compared to, for example, a gearbox drive solution which has been “good enough” for many years. But in the same way smart phones and the Internet have evolved from a luxury to a necessity, despite lower-end technology still existing (there ARE those who still buy flip phones, as well as still about two million people who use dial-up), eventually the benefits of a more advanced technology becomes too difficult to ignore. In today’s highly competitive world, the better someone understands the advantages and benefits of direct drive technology, then the more they will have an advantage in machine building, giving them an edge over their competition. Changing the direction of current changes polarity and changing the amount of current changes the magnetic force. Put a highly conductive material within the coil, such as iron, and the magnetic force is increased exponentially. The last factor is to have some magnetic material for this field with which to interact. In this case, it is a row of permanent magnets. Depending on the coils location relative to the magnet, the current can be adjusted in terms of its strength and polarity, creating a push/pull force on the magnets. The resulting force is capable of moving an object without making physical contact. 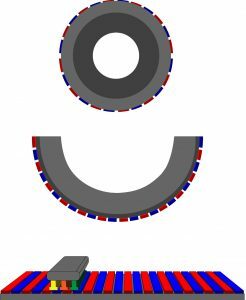 This force generates a linear motion when using a flatbed track of magnets and a rotary motion when using a curled-up ring of magnets. The applications may be different but the technology is exactly the same. Figure 3: Torque and Linear motors operate on the same principles. It was mentioned before that to get the desired motion, the coils (each called a pole) need to change their polarity and strength relative to the magnets to maximize the force delivered. 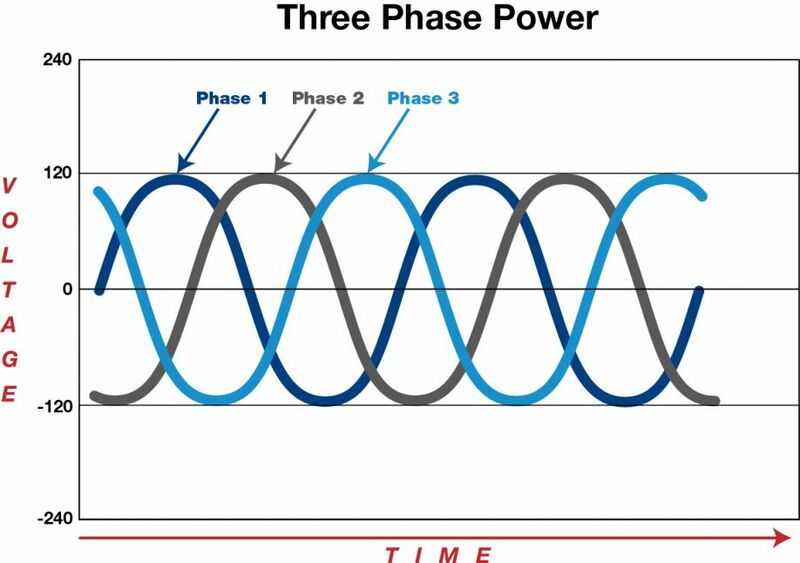 The standard nowadays is for there to be three different coil behaviors, called phases, acting upon the magnets at the same time. Figure 4: It’s ideal to have current the strongest when a coil is between the magnets. For this reason, the type of motors using this method are called 3-phase synchronous motors. All that a motor has as an input when it comes to performance are three wires for current and, for this reason, motors do not have any compatibility issues with different controllers. Once the working principal is understood, it is easier to see the benefits of this technology. One of the advantages is the large force density it brings. With the motor having only two parts — the magnets and coils, they are incredibly compact for the power they deliver. The small moving carriage of a linear motor and the large hallow shaft of a torque motor allow the payload to be mounted directly to the motor, ensuring making the most of the space within the machine. This also delivers a high mechanical stiffness and allows for a greater dynamic range of motion since the forces are not being transferred through multiple parts, which also eliminates backlash and inertia mismatch. This result is a force transmission method that can perform over a wide range of force and speed without having to make mechanical adjustments, and whose performance and precision is only limited by the feedback device to which it is attached. With these types of benefits, one may wonder why it is not more widely adopted. The reason mostly revolves around upfront price and complexity of integration. Because of cost of material, mostly the permanent magnets, there is a hesitation towards making the investment to switch over. Along with that, when someone is already familiar with a gearbox or ball screw solution, its familiarity can be comforting. Dealing with those two factors at the beginning can look very intimidating but what needs to be understood is that a lot of the value from direct drive comes from its long term use. If a machine maker is able to make the most of its performance, they are able to greatly increase the throughput of the machine and not have the cycle interrupted with a machine down due to maintenance and part failures. When properly integrated, the user has has a motor that could be operating 10 years down the line and will perform just as well as one that is newly installed. Every year, more machine makers are seeing the benefits of direct drive but to get the most out of them, it is important to understand their limitations as well. The concept of the force transmission being coupled directly to the payload is similar to the concept of semi-closed loop when it comes to encoders. The idea being that the less “degrees of separation” between the part, the greater will be the overall performance. If the reader imagines the different components as parts of the human body: the controller as the brain, encoders as the nervous system and the motor as the muscle. You can have one of the strongest muscles out there but if the signal to it is muddled or cut off, then you are not going to get the proper movements. Like the human body, if you are not careful, the user can run the risk of overexerting and damaging a motor. Most of the time, a motor’s performance is limited by how much force/torque a motor can output without overheating. The better this is controlled, the more performance is available from a particular model. Take a look at the continuous value of the motor (Continuous Force with linear and Torque with rotary); this is an average value a motor can run at 24/7. This value is the most malleable since it is very dependent of how the motor is able to dissipate heat. 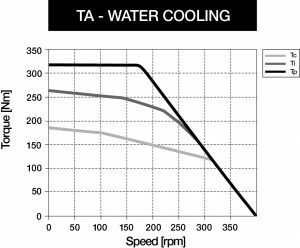 If the motor has some type of heat sink or is liquid cooled, there is a noticeable increase in performance, sometimes even doubled with liquid cooling due to how much heat is dissipated. Getting the exact values are realistically a matter of trial and error but pay attention to any guidelines given on a datasheet for what is being taken into account. A motor is able to perform well above the continuous value up until the peak value. The motor is physically unable to go higher than this value typically because it is the point where so much current is added to the coils, the user runs the risk of demagnetizing the magnets. Although not as flexible as the continuous value, the time a motor can reach the peak varies from as long as two seconds to tens of milliseconds so be sure to get an idea of the length of time if it is a point hoped to reach. If heat generation is thought of as the integral of the force value, this should give you an idea of how it all comes together. Figure 5: The diagonal slope is where Back-EMF is too much to counter. Speed is one more value that can vary the performance. Going back to the basic concept of magnets and coils, when the magnets move past the copper coils, a current is created within the copper and creates a Back-Electromotive force (or back-EMF) Voltage. To compensate, the controller has to input more current to counteract this current normally used to give the motor its power. The result is that the greater the speed at which the motor operates, the more difficulty it will have reaching similar force values than if it were operating at lower speeds. The greater the surface area between the magnets and coils, the greater the Back-EMF which is why a motor has lower speed capabilities as it gets larger or has more poles. Although this is not the only property that affects this (Eddie currents can occur and heat up parts of the motor), it is what affects it the most (Figure 5 shows how all these factors affect speed in a TMB+ torque motor (0210-07-TA2SP). Direct drive is a very advanced piece of technology, to the point where each one of the concepts mentioned previously can be developed into its own article. The point here is to understand what this technology is, what the benefits are that machine makers can take advantage of, and the meaning behind the most important parameters. From there one can expand their knowledge of key direct drive principles to be as efficient as possible but, at the very least, one could start with a framework to develop an understanding. From there, it is a matter of deciding the value of investment that direct drive can offer for a new machine design. Different companies have different levels of investment into direct drive technology and, in the case of ETEL, it has been the focus since the inception. From Machine Tool, to Aerospace to Semiconductor Manufacturing, direct drive has increased the quality of manufactured products in many industries. As the standard of quality increases, the machines will need to adapt to the newest and best technology and direct drive is a prime example of how this can be achieved with a method that promises to be here for years to come.